or to paint with a lead white. 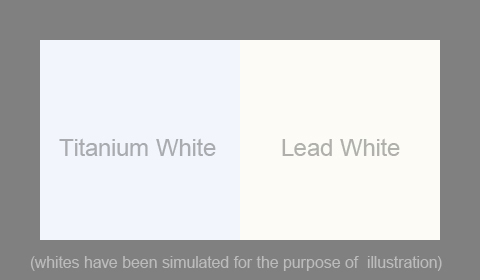 But if you are adamant against working with lead white, yet wish titanium had some of its working properties, what can you do? 1. Lead white is the warmest white available to the oil painter (see illustration above). Because of that warm cast lead it can play nicely with light values and weaker tints, the kinds of delicate passages you find in many skin tones and neutral colors. Especially if you paint with a lot of classic earth colors. 2. Lead white paint is less opaque than titanium white. Unless the white in question has been unduly adulterated by its manufacturer. At first you might consider lead white’s weaker tinting strength to be a bad thing but a lower tinting strength can become an advantage when attempting to replicate traditional effects produced by Ye Olde Masters. Effects such as such as overpainting, scumbling, or the laying in of a semi-transparent color on top of an earlier passage. Often, modern titanium white is too strong or too blue and overwhelms the color it is mixed into. Often it makes that color appear, well, chalky. 3. Lead white exhibits a distinct thixotropic property as you move it around with a brush or palette knife. Lead white tends to glide in a unique manner while it is in motion. When the motion ceases the paint drops or freezes. And lead white can transfer some of this effect into another color it has been mixed into. The titaniums I have painted with do not exhibit this behavior. And finally, lead white tends to be stiffer than most titanium whites and is less likely to level out as the paint film dries. This retains a crisper impasto. 4. Lead white will gently accelerate the drying of the oil film and strengthen the film as it does so. Without going into the chemistry of it all, the lead is a through-drier so it can speed things up without the structural dangers normally associated with using a surface drier such as cobalt, or other metal driers which pull in oxygen from the air above the film. Next, you need to reduce the tinting strength of the titanium in your titanium/ochre white. To accomplish this, you start by mixing some linseed oil into a pile of finely-ground marble dust. (aka, calcium carbonate). Use a hand muller on glass if you have them, or a substantial palette knife on a clean surface if you don't. Exert a fair amount of pressure as you mix everything together because it must all be well incorporated before the next step. (BTW, marble dust is inexpensive and available at most art stores. Or it can be ordered online.) The consistency of your final oil and calcite blend should equate the consistency of your titanium/ochre white. Now, begin mixing a little of the oil and calcite blend into your titanium/ochre white. As you increase the amount of calcite you are lowering the opacity of the titanium. (As a point of historical fact, Velazquez often worked calcium carbonate into a number earth colors to affect their opacity. Much of the transparent beauty found in his limited palette comes from this trick. You can use you oil and calcite mixture for the same purpose). And finally, to emulate the impasto effect lead white imparts to a brush stroke, try incorporating a small amount of artist-grade beeswax. (You will find that very little wax is needed to mimic the peaking effect of lead white.) The wax creates a shorter pull to your paint mixture and thus your mock lead white will sustain sharper peaks and striations. Good enough for impasto work. I recommend you add the wax on your palette as you need it and not incorporate it into a tubed mixture. That way you will always have the option of working with a short or long mock lead white. You will likely want to experiment with different proportions of these additives to find your preferred mock lead, but once you find it take note for future reference. You can then make a large batch and tube it up for later convenience. Sealed properly, your mock lead white should last as long as any other oil paint. Note: Modifying a titanium white paint as described above may be considered within the bounds of sound painting practices so long as the resulting paint doesn't become oil-starved by the addition of too much calcite. Or, that the integrity of the dried paint film is not compromised by the addition of too much beeswax. But those caveats hold true for any kind of oil paint, not just your blend. The usual and customary cautions regarding the thickness and application of impasto work still apply. Have fun, and keep painting! That is a very interesting trick Thomas, and great info on whites. The only use I have for titanium is maybe some wet in to wet studies where I want to move paint around quickly. But for the "meat and potatoes" of painting you just can not beat Flake whites properties. Jim, I totally agree for the most part. However, I will be next posting a short series on using titanium and lead white together as I do think they compliment each other. Since we have both to work with, and each have their own helpful properties, why not exploit them simultaneously? Great post. What can you say about Gamblin's Flake White Replacement? Are the properties close to the formula you mentioned above? Jessie, I haven't worked with Gamblin's Flake White Replacement for many years and I am aware it has undergone a few tweaks in the time since. So I would be uncomfortable speculating. GAC's number is 503 245-1945. Ask for Scott and let him know I encouraged you to contact him. Wow thank you! Will definitely contact them for sure. Would you happen to have his company email address as well? I would prefer to write first over making a cold call. I bought a tube of Flake White Replacement in the early aughts and found it to be rather much like the TiZi white Gamblin produced except it was a bit stiffer. Seemed rather unpleasant and nasty, plus it failed at the main reason I bought it, its tinting strength was much the same as the TiZi White. If you can find it at a reasonable price Cermaic White by Holbein is worth a shot, as is the formula proposed in the post. Thanks, Tezia. When I get home from Carmel I'll buy some and try it out. In addition, they have a Griffin alkyd mixing white that may also be an alternative (some solvents in the paint though). Standard Ti mixed with the Natural Pigment's putty mediums could be another precanned solution. The more options the better! Teazia (a lovely name...), of all those options I am most intrigued with mixing putty into titanium. That would cut the tinting strength and perhaps slightly warm the color cast. It would also lengthen the pull of the paint. And for those who may not know, "putty" in this context is a mixture of marble dust or calcium carbonate hand-mulled into a drying oil, and it was used extensively by Velasquez in place of white in many of his mid-tones. Putty has the ability to lift the value of an earth pigment and make it more transparent, without shifting the warm or cool bias of the starting hue. Something white will always do. But of course, at some point you need to use a white, be it titanium, Lead or something else, to get the upper values a painting needs.